Lyndell’s is an old school bakery that has been around since 1887. They are famous for their half moon cookies, which are not actually cookies, but small rounds of golden cake, frosted with ½ chocolate frosting and ½ vanilla frosting. The first tray had 3 cupcakes, all golden cake with 3 different frosting variants: strawberry, chocolate and vanilla, an éclair and a Bismarck (a cream and strawberry-filled pastry). After trying all of the cakes, I determined that the golden cake was the best, the chocolate was dry and the chocolate frosting was better than the vanilla which was too sweet. 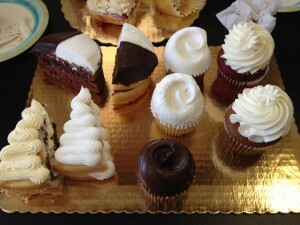 The prices were surprisingly high: the cake is $4 per person, and the cupcakes are $2.50 a piece. They were super nice at Lyndell’s and when we finished I got handed a cake box with a fresh tray of all the samples we just tried. It was insanely generous. 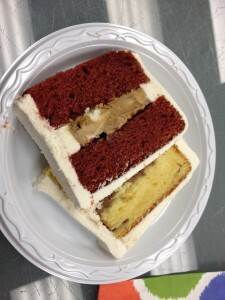 Perhaps, I have been spoiled by all the different tastings, but when I was served two merger slices of cake: red velvet with mocha filling and almond cake with chocolate mousse, I was shocked. The cake was good, but the mocha filling was so strong, it was bitter. The almond cake was too floral – almost like eating almond perfume. 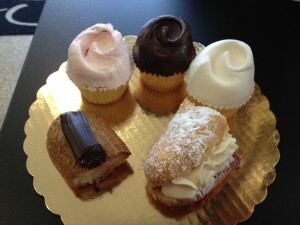 Their cupcakes come in three sizes: petite ($1.5), regular ($2.5) & jumbo (3.5). I got 6 petite cupcakes to try at home: key lime, peanut butter, salted caramel, lemon, oreo and carrot. I wasn’t impressed by any of them.